I hope you have had a good life so far, and that your parents are as loving as I had hoped. 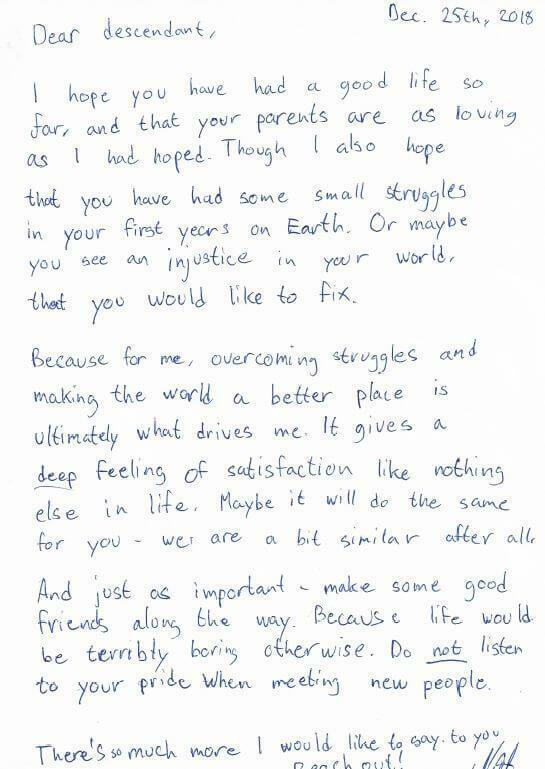 Though I also hope that you have had some small struggles in your first years on Earth. Or maybe you see an injustice in your world that you would like to fix. Because for me, overcoming struggles and making the world a better place is ultimately what drives me. It gives a deep feeling of satisfaction like nothing else in life. Maybe it will do the same for you - we are a bit similar after all. And just as important - make some good friends along the way. Because life would be terribly boring otherwise. Do not listen to your pride when meeting new people. There's so much more I would like to say to you.